Getting the most out of your existing software investment is important to any company. Everyone wants to improve their productivity and drive down costs, and have a better judgment to advise business decision makers on future technology investments. The Cloud Summit 2013, Singapore held on 22 May 2013, at the InterContinental Singapore focused on what’s relevant in today’s business including key Microsoft technologies that help companies achieve the most from their investments. Key products and technologies highlighted include Server & Virtualization Management, Application Management, Service Delivery Automation and Fabric Infrastructure Management. 3 Southeast Asia MVPs from Singapore, Malaysia and Sri Lanka were guest speakers at this event, sharing their specialties with the Microsoft enterprise customers. “Looking at how StorSimple can solve challenges around VM sprawl and archiving with Hyper-V and VMM” said Singapore System Center Cloud and Datacenter Management MVP Daniel Mar on his session. More than 400 participants attended the full day event. 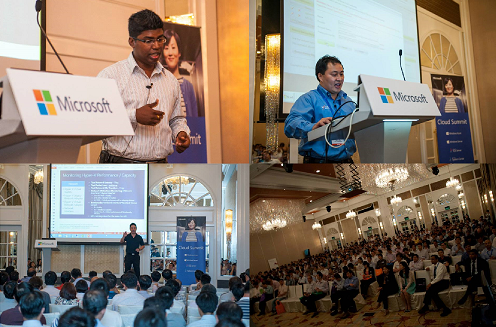 ← SEA MVPs Attracted Over 170 @ SharePoint Community Day 2013!